I enjoyed your recent newsletter posting with the 1920s photo, which I think was shot at Perranporth in north Cornwall if my memory of the landscape is correct. However, I have to take issue with the editorial comment about surfing's place in the local consciousness. When I grew up in Newquay during the 1950s, surfriding on plywood bellyboards was a big deal during the summer months, especially during July and August when the water was at least passably warm and hordes of tourists flocked down from the industrial cities of the midlands and north. Our local "beach boys" rented out such boards, along with deck chairs, canvas windbreaks (the northwest wind could be a beach party killer even when the sun was blazing) and visiting tourists could get a "tea tray" with a pot of tea, cups and saucers, mini milk jug, sugar pot, teaspoons and a plate of scones and jam with Cornish clotted cream. They didn't do that in Waikiki! From the time that could swim, I and like-minded friends would "surf" from May through September on such bellyboards, usually plywood but (like my favorite) sometimes a single plank about four feet long, a foot wide and one quarter to one half inches thick. (Alaia?) All had a scoop nose steamed in. Usually they were ridden in the foam, launching into an already broken wave and planing to shore, as in your photo. But, I guess because we did so much of it, us "locals" found that on small days, when waves broke in waist- or chest-high water, we could launch across the face and get at least a short ride in the "green water." 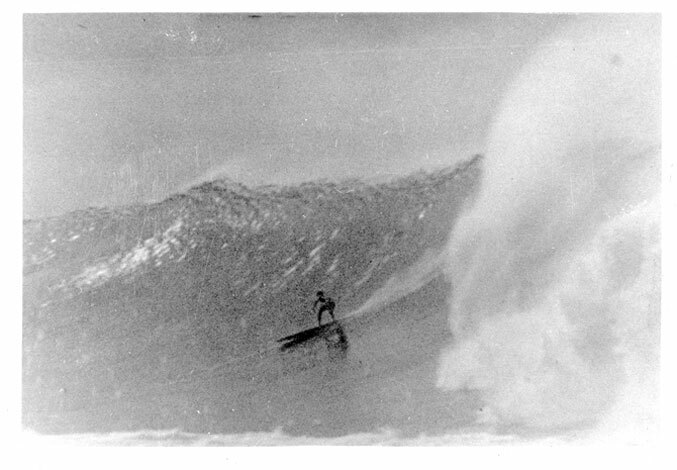 By 1960-61, I and a few others figured out that on a big swell we could swim out with our boards, using kid's size swim fins, and take off on bigger waves, getting a much longer ride on the open face, especially at high tide when waves refracted/reflected off the cliffs, giving a wedge effect. (I should point out that conditions varied rapidly and radically because of the 17 - 22 foot tidal range). It's funny to me that even supposedly well-informed people so underestimate the wave action on the coast of Britain exposed to the North Atlantic. "Oh, there's surf in England? It must be pretty weak!" Not so. I grew up with fishermen who knew where to avoid 60-foot cloubreaks. I've seen bigger seas off the coast of Cornwall than I've seen on the North Shore of Oahu. As for surfing in Britain being only recorded since the advent of stand-up boards? What happened was that tourists would come, rent surfriding boards, get swept out in the horrendous rips that occur when a 22 foot tide is on the ebb under big swell conditions. After cups of tea and clotted cream scones, they'd drown. It was very bad for the tourism business. So the local councils, in their wisdom, decided to hire qualified Australian lifeguards during the summer months. They brought stand-up surfboards with them. The rest is history. Oddly, the lifeguard at my local beach (Tolcarne, in Newquay) was a longtime kama'aina Hawaiian, Jack Lydgate, from Kauai (check Lydgate Park, Kauai). Boards were scarce in those days and, after much pleading on my part, Jack took me out and gave me a lesson, pushed me into my first stand-up wave. Lydgate was 6' 6", tanned, muscular with the whitest teeth we'd ever seen. We were in awe -- called him "Mahogany Jack" !!!! 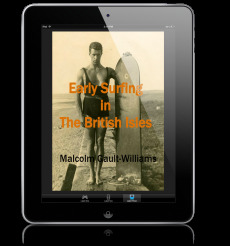 My friend Roger Mansfield has authored a book about the history of surfing in Britain which is due out later this year. I for one can't wait to see it. Roger was Britain's Junior Champ in the early to mid’60s and is about three years younger than I, but he was in on the ground floor of all this. I know that one of the great stories he's uncovered is how our local ice cream man, an Italian-born immigrant, had gone to Hawaii in the late ’20s or early ’30s and brought back a plank board of the era, surfed it in England, and then gave up the sport to concentrate on his ice cream business. As kids, we used to buy ice cream from M. Saffieri's van. It was the best ice cream I ever tasted, but even as he knew we were all getting into surfing, he never talked about it. Roger interviewed him for the book. Staffieri has since passed away. Sorry to be so long-winded. Just had to share that. Pete Robinson of the British Surfing Museum has unearthed some great shots of bodyboarders surfing English waters in the 1920s.